Anytime job seekers are thrown into a non-traditional interviewing environment, stress levels rise and anything can happen. If the experience isn’t one-on-one, heart palpitations and sweaty palms result. I heard from a client this past week who participated as a candidate in a group interview, and he did very well, winning an individual interview and the job. Here are some things we can learn from his success. If you are faced with a casting call experience like this, where it is you and a crowd, be prepared to tell your story quickly. Those who rise to the challenge in this setting and make a strong positive impression are the candidates most likely to make it to round two. Second, know your material and your success stories well. If a question is thrown to the group about results, accomplishments or anything else that you should be able to talk about, be ready to respond without hesitation. You want to get your story out. Be alert! Be sharp! Third, and most important, be confident. 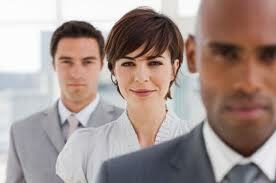 Your confidence will come across in both your verbal and non-verbal communication. Speak clearly, with energy, and make eye contact at some point with all of the interviewers. Sit up in your chair, smile and show some enthusiasm. Be the person that the interview panel will notice. These sessions are designed to do two things. They allow for efficiency and an easy way to eliminate people from consideration. The quiet person in the back of the room is going to get cut. They are also designed to get you to show your personality and confidence (or lack of both). You have a lot to tell and accomplishments to be proud of or you wouldn’t have been invited to interview. Turn the confidence up, get your stories ready and shine. Make the impression that will want the panel to bring you back for more.